C.M. Mose & Son is a company that was started in 1954 by Cliff and his son Pete Mose. Pete’s son, Roger, began working along his father at the age of 10. Young Roger did what any 10-year-old boy who loved being with his father when he worked would do; he strapped on a tool belt and handed Dad the tools he needed to get the job done. C.M. Mose & Son has taken a leap forward in the services they offer to homeowners over the years. As a third generation owner of C.M. Mose & Son, Roger Mose has brought his own insights to customer service and quality offerings to homeowners and small businesses in Kansas City. There are old school ways of doing things today, but Roger has embraced the new technologies available to C.M. Mose & Son and the results have benefited their customers. Roger’s concentration at C.M. Mose & Son is to provide the highest quality service possible. The company’s focus is solution-oriented with a friendly staff, professional and knowledgeable technicians who use the highest level of technology that is available to the profession today. They emphasize the customer’s needs and bring the customer service traditions of C.M. Mose & Son over the past 60 years to bear along with Roger’s modern focus on technology and efficient service. There is a reason why C.M. 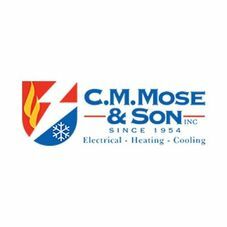 Mose & Son has been in business to serve their customers heating and air conditioning, electrical and CurrentSAFE needs: because they are experts at what they do. They are respected in their community and you can trust that they charge a fair fee for the work and products they sell, service and repair. You can’t say that about all people you do business with. Can you? When you have an air conditioning, heating or an electrical need, call or contact the company who has been here for the last 60 years and the one that will be here tomorrow. Call C.M. Mose & Son at (816) 781-4707 today. We’ll do our absolute best to make sure you are taken care of.